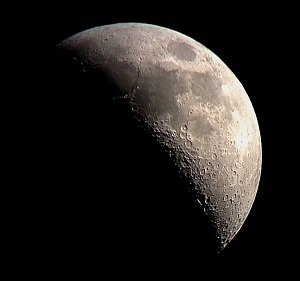 My star gazing sabbatical is over, and I'm once again borrowing my mother-in-law's DSLR lenses. I actually had a co-worker ask me the other day why I stopped posting night sky photos! Chris' brother dropped the lenses off last week, just in time for the tail end of the Perseid meteor shower. I put my camera out in my (now fenced-in) back yard with a shutter lock taking 15 sec exposures until the battery died. I got 550 shots and started sifting through them on Friday morning before work. 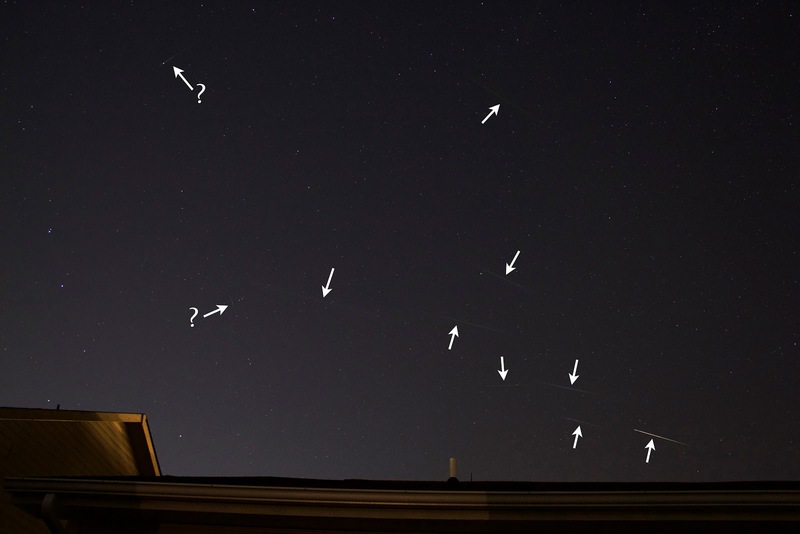 I found a total of 8 confirmed Perseid meteors originating from the radiant, all with javelin shape, and no light trails in the frames before or after (eliminating other satellites and planes). 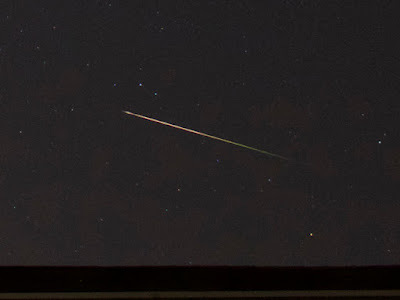 I also saw 2 other anomalies that are either non-Perseid meteors, or some other kind of flare. I made a rushed composite before work, planning to come home and fix it later. When I tried, I ran into a lot of problems. 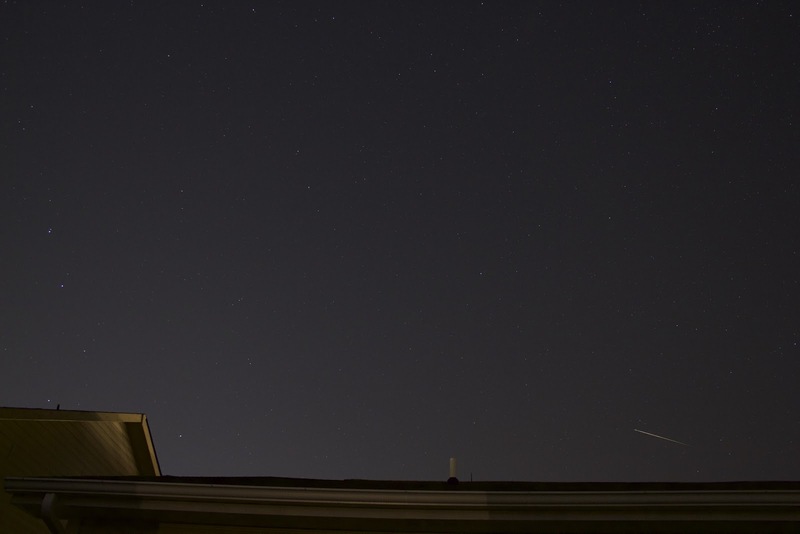 The light changed over the course of the night with a very thin haze, so layering the brightest pixels from my other images into one composite wasn't very straight forward. Trying to match the background color led to some very faint fuzzy halos around the meteor streaks where you can tell I cut them out. 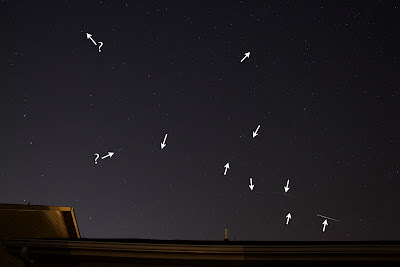 I'm not sure how to get rid of them without dimming the already faint meteors. 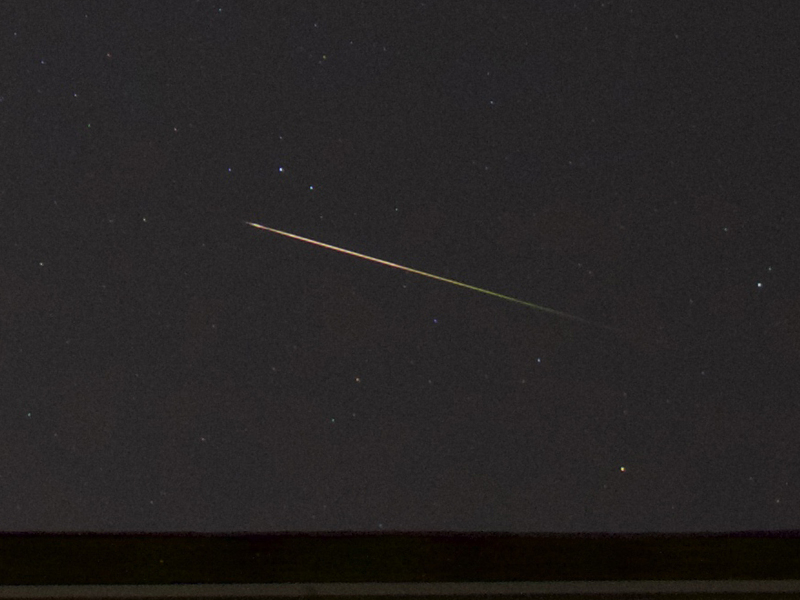 At least I got one meteor that stands on its own, this bright one that starts out greenish. A nice catch! As always, the bonus prize after a night of meteor watching is a nice batch for star trails (in addition to 5 bug bites). I took the time to remove airplanes in this one by simply painting over them with black. Since the black isn't counted when each light pixel is added, it doesn't need to be blended or clean at all. 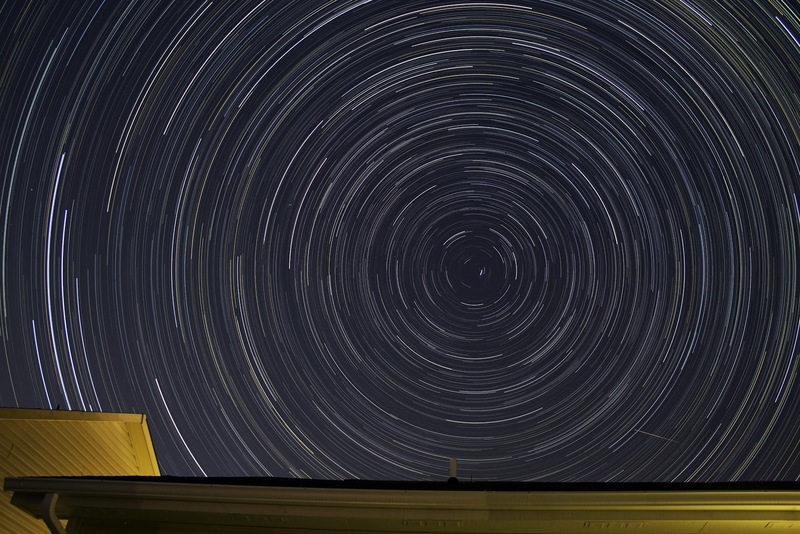 Removing the planes really turned this decent star trail into probably my best, longest north-facing trails. It makes me think of a time warp! I still need to add more foreground objects to compose my photos better, but it's good to be back!